Cheiracanthium is a genus of spiders commonly called the yellow sac spider. Its venom contains the substance cytotoxin, like that of a brown recluse. Cheiracanthium is a genus of spiders belonging to the Miturgidae family. It is commonly called the yellow sac spider. 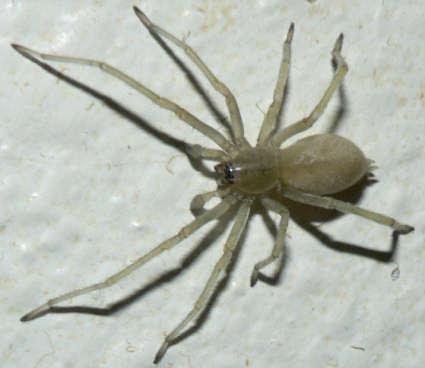 Yellow sac spiders have a generally pale color and an abdomen with a color range of yellow to beige while having no distinct markings. The mouth parts of sac spiders are darker in color while a faint dark stripe is evident lengthwise towards the abdomen. The front legs of this spider are longer than the three other pairs. They are small such that both female and male can grow only up to 10 mm and as small as 5 mm. Female sac spiders lay about 30 to 48 eggs and protect or guard them within a coat of loosely spun silk which can be usually found along ceilings and corners or behind pictures and shelves. Sac spiders are normally outdoor spiders that frequently invade structures. The population of yellow sac spiders increases during fall or when the weather starts to cool. They actively hunt for food, which are usually small insects, at night. Sac spiders can run fast by waving their forelegs before them when catching their prey. They are usually positioned on walls and ceilings when indoors and suddenly fall to the floor when disturbed. A yellow sac spider can form a silken sac at the junction of a wall and ceiling, within a leaf, and even under timbers or logs and use the sac for an early retreat. These spiders do not build webs. The venom of a yellow sac spider contains the substance cytotoxin which has the capability to destroy cells much like the venom of a brown recluse. However, yellow sac spider bites can heal much more quickly than the bites of a brown recluse which takes about 2 to 3 months to heal. The reaction of a yellow sac spider may vary greatly from one individual to another. Sac spider bites are much more common than any other type of spider but are often misdiagnosed as a brown recluse spider bite. The common symptoms of a yellow sac spider bite are a stinging sensation, redness that follows the stinging sensation as well as mild swelling. Some cases of yellow sac spider bites may cause blisters and a break which can cause a sore that takes about weeks to heal. A mild illness can also be felt by a person bitten by the yellow sac spider.